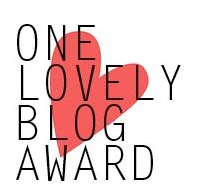 The lovely Madame Croquette has nominated me for a One Lovely Blog Award. My first award; I’m thrilled! Thank you, Madame, for honoring my blog as lovely! Funny thing is, often when I’m writing a post I think to myself, “Gosh, I use the word lovely a lot. I need to come up with a different adjective.” Lovely is one of my favorite words, so to be nominated for an award with lovely in the title is, you guessed it. . .lovely. 1. Share whoever gave this award to you with a link back to their blog (above); 2. Write 7 random facts about yourself; 3. Give this award to 15 other bloggers; 4. Let them know they have won; 5. Pop the award on your blog. 1. I was born in Massachusetts and spent my childhood there. It’s one of my favorite places on earth. 2. 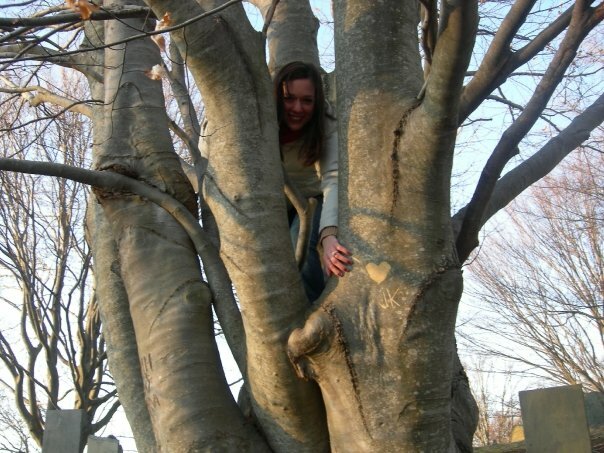 I got engaged in a graveyard whilst sitting in a tree. 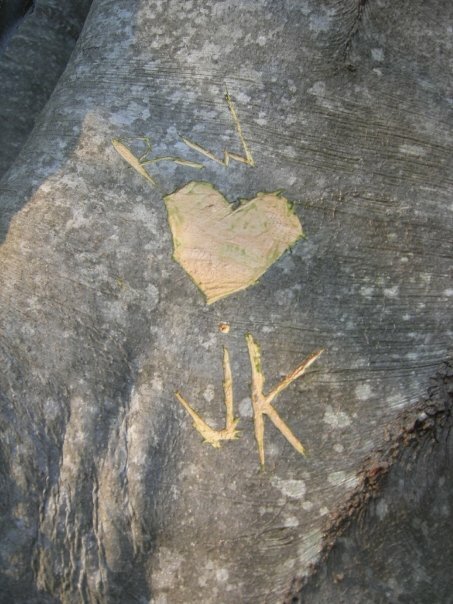 The husband carved our initials in the tree. Aw. 3. Not sure this is a random fact, because it doesn’t feel random, but purposeful: I love Jesus and talk to God each day. 4. My favorite cookbook right now is Anthony Bourdain’s Les Halles Cookbook. I love it and Bourdain. Kahlen from Season 4 and my favorite contestant of all time. Photo credit: listal.com and most likely ANTM and maybe Tyra Banks. 6. I have a degree in Elementary Education and taught kindergarten (briefly) and first grade (even more briefly). I applaud all the teachers out there workin’ it in their classrooms every day. 7. Given the fact I have already mentioned ANTM, this random fact will make me seem very, very shallow, but I’m okay with it: I have been watching Friday Night Lights on Netflix. Ergo, I am in love with Tim Riggins. Even the husband has said (more than once), “Tim Riggins knows how to wear a pair of jeans!” Indeed he does. Picking 15 blogs when there’s countless quality, useful, and lovely blogs out there seems unfair, but those are my picks nonetheless. Now I’m off to make myself a One Lovely Blog Award t-shirt. Represent. Lovely nomination for a lovely lady writing a lovely blog. What a lovely compliment! Thank you. Thank you so much! This is totally awesome! AND you even have some guilty pleasures on your list, so I feel like I won twice here 🙂 I *love* Bourdain and ANTM. I’ve watched every episode of ANTM, I actually am hoarding the last episode of the current season on my DVR right now. I think Sophie’s got it in the bag. Don’t you feel like you have such an appreciation for how hard modeling is now?? LOL, my husband gets so annoyed when I try to prove that point. Haha! You are so very welcome! If Bourdain ever comes to a city near you, you must go see him. He talks for two hours. That’s all he does and he’s AMAZING (and funny). I haven’t watched the last episode of ANTM either! I’m planning on watching it today. Sophie’s been my pick from day one. Ask your husband to smize and see how hard he thinks it is. 🙂 <—emoticon can't even smize Thanks for stopping by! Thank you! So do you! Yes, the husband is an amazing person. As weird as it sounds, that graveyard is one of my favorite places! CONGRATULATIONS!!! I don’t have to tell you how proud I am of you. You are an amazing woman and I love you! Ya know, WordPress was rather glitchy when I was commenting on other blogs, so who knows. And you’re very welcome. Love reading your blog.